Art of Fighting is a competitive 2D fighting game by SNK. It features 10 playable fighters in the 2-player versus mode, but only two of those characters are playable in the single player mode. The story mode is a series of fights with some plot or bonus stages in between, similar to the Arcade mode of many other classic 2D fighters. The game has your typical punches, kicks, special moves, and throws. 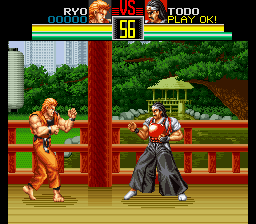 A unique aspect of the game is its spirit gauge, which depletes as the player uses their special moves. You can also deplete your opponent's spirit gauge by taunting them. As the gauge depletes, your special moves get weaker. 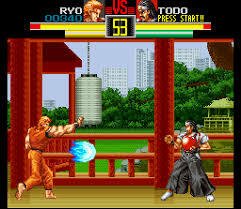 This game was one of the first fighting games to feature a "super" move as well, which is learned by completing a bonus stage. Now you can add videos, screenshots, or other images (cover scans, disc scans, etc.) for Art of Fighting (Europe) to Emuparadise. Do it now! If you haven't noticed yet, we have a retro game of the day feature (top-right of the screen) wherein we feature a new retro title every single day! Now, you can vote for your favorite games and allow them to have their moment of glory. 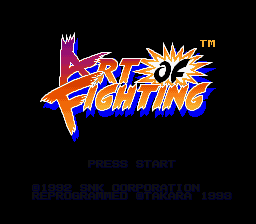 Click on the button below to nominate Art of Fighting (Europe) for Retro Game of the Day.